Bou: adelanto de "El Empleo"
ya se está terminando la post, espero llegar a Annecy. Publicadas por Bou a la/s 2:24 p. m.
Que lastima q me perdi lo de Caloi en su tinta...! Sorry, my spanish is too far behind, I need to write in english, hoping you'll understand. I've seen your film "El empleo" in the Annecy program about the value of work, because our movie "Monsieur Cok" was in it. I wanted to tell you that I have found your movie really remarkable, very sensible and with an animation quality I like very much. This movie should have been in competition, it's a total shame for the selection jury to have left it aside. Thank you for this beautiful piece of work, it was certainly one of this year's Annecy highlights for me, as well as for my wife. Richard thanks for your nice words! I just saw the trailer of your film Monsieur Cok, it looks amazing! if you want I'll write to you via email. I'm really interested in your work. yes, I'm french, just as the other Papy3D founders. Actually, Monsieur Cok is from Franck Dion, I'm just running the (very small) company. Please do send an email, I would also like to see your other works. 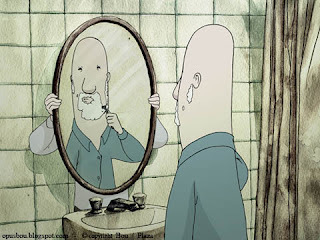 I've seen both Monsieur Cok and El Empleo at the Anima Mundi Festival, and I think they're both wonderful films. Congratulations / Felicitaciones! Oiê Bou! Assisti seu curta no Anima Mundi e achei ele dos melhores, tanto na história quanto na qualidade. Parabéns! Hola!! He visto el corto en Animadrid y me pareció genial!! gracias marcita, iara y eugenia!! Once again, mil felicitaciones for the Grand Prize in our festival, anim'est Bucharest, Romania. Hoy a las 22hs gran estreno gran, de "El Empleo" aca en LP. Todavia no lo vi¡¡¡, pero tuve el privilegio de ver el backstage. Buena idea y excelente trabajo artistico, asi que... grandes chances de ser el namber uan, exitosssss y abrazo desde LP. gente de Anim'est: mil gracias por el reconocimiento!! chelo: miralo y contame. un abrazo pepetete. Vi el del hombre y el pájaro y me parecio maravilloso, me gustaria poder ver el del empleo, lo pudeo ver por internet en elgun sitio? TE FELICITO SANTIAGO TUS DIBUJOS SON DE UNA HUMANIDAD INFINITA. SALUDOS! te cuento que no vamos a subir El Empleo a la web hasta que no termine de pasear por unos festivales que le quedan. La unica manera de verlo ahora es en alguno de los festivales donde esta,, que no son pocos. despues de eso lo subimos y avisamos.